Summary: Curiosity does drill tests, crosses Vera Rubin Ridge. 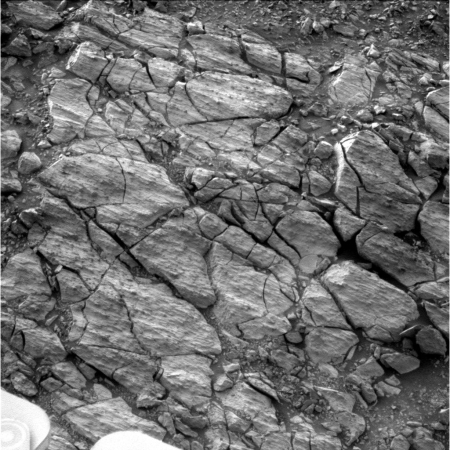 Opportunity finds evidence of either ice or wind scouring on rocks in Perseverance Valley. Since my last update on September 6, Curiosity has continued its travels up and across Vera Rubin Ridge, a geological bedding plain dubbed the Hematite Unit. The panorama above, created by reader Phil Veerkamp, shows the view looking up the ridge slope. If you click on it you can see the full resolution image, with lots of interesting geological details. The panorama below, also created by Veerkamp, shows the view on Sol 1866, two weeks later, as the slope begins to flatten out and the distant foothills of Mount Sharp become visible. (If you click on the image you can see a very slightly reduced version of the full resolution panorama.) This image also shows the next change in geology. From orbit the Hematite Unit darkens suddenly at its higher altitudes, and Curiosity at this point was approaching that transition. The rover is now, on Sol 1876, sitting on that boundary, where they will spend a few days making observations before moving on. 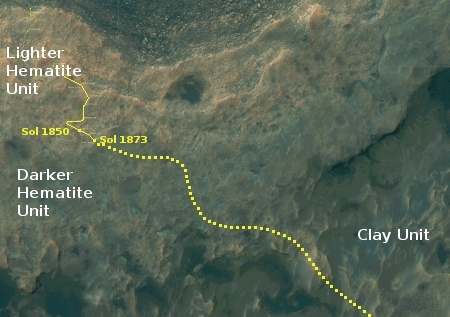 The image on the right shows Curiosity’s approximate position, about halfway across the Hematite Unit and with the rover’s approximate future route indicated, as shown in this October 3, 2016 press release. In the two months since my last rover update the Curiosity engineering team has spent a lot of time imaging and studying the Hematite Unit. They have also spent a considerable amount of time doing new tests on the rover’s drill in an effort to get around its stuck feed mechanism in order to drill again. Only yesterday they took another series of close-up images of the drill in this continuing effort. As indicated by the October 3 2016 press release, the rover still has a good way to go before it begins entering the distant canyons and large foothills. While they should leave the Hematite Unit and enter the Clay Unit beyond in only a few more months, I expect it will be at least a year before they pass through the Clay Unit and reach the much more spectacular Sulfate Unit, where the rover will explore at least one deep canyon as well as a recurring dark feature on a slope that scientists think might be a water seep. The winter season and its limited sunlight available to recharge Opportunity’s batteries continues to limit activities. However, for the past two months, since my last rover update, the science team has continued to do short hops up and down within Perserverance Valley, taking many close-up images of the ground in an effort to determine how the valley formed, whether by flowing liquid water, ice, or winds. 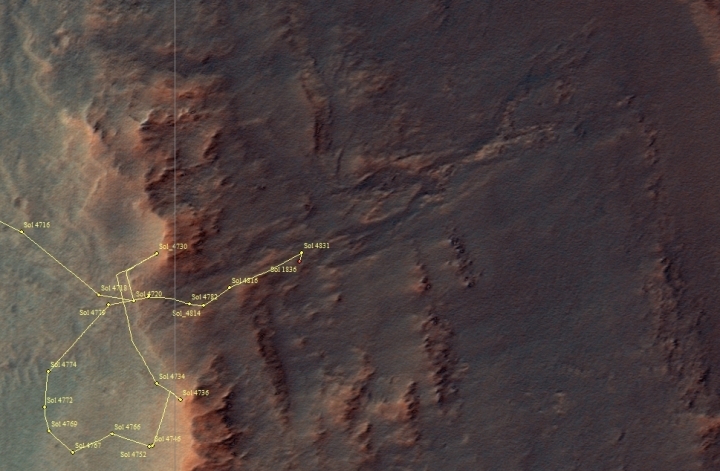 The traverse map below shows its travels through 4836, almost sixty sols ago. Since then there has been no update of the rover’s traverse map, mostly I suspect because things haven’t changed much. Since then the weekly update by the science team indicated that they remain uncertain about the cause of this aligned scouring. The rover is investigating a site where there is evidence of scouring, by wind or otherwise. Regardless, the scouring suggests that while liquid water might have caused the valley’s overall flow feature, other geological processes, including either flowing ice or wind, must have produced the aligned features on the rocks. This is a significant discovery, as it indicates that any water flows here were probably short-lived and might have changed from liquid to ice periodically. It is also possible that wind, blowing down the valley, might have also produced these scours, which also suggests the water/ice flows were only a short part of the process.